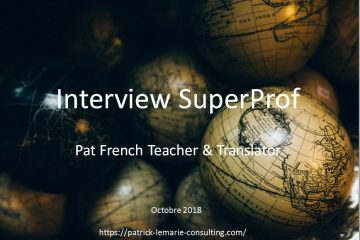 Superprof website asked me to speak about my job as an online French teacher, a translator and an interpreter. My opinion is that any potential student has an interest in knowing the educational and professional background of his/her future online French Teacher or instructor. The embedded video was made from the written interview by https://www.superprof.fr/ in October 2018. The following text is the script contained in the video. 1 – Are you fluent in this language because of your background or because a teacher has made you want to learn it? First of all, I started learning English when I was 11, then I participated in a twinning exchange when I was 14. Above all, I have always enjoyed learning languages and discovering new cultures. I speak fluent English and I am also a qualified translator-interpreter in the French/English language pair, consecutively and occasionally simultaneously. Furthermore, I have been a professional translator and interpreter since September 1981. Finally, I have been teaching in English at the University of Le Havre for 18 years (international management, business ethics, terminology, etc.). I can also speak Spanish and German. 2 – Name the living, historical or fictional character who, in your opinion, is the emblematic representative of the culture in question! Winston Churchill. A complete man. First of all an officer who served his country, then a talented writer, a brilliant politician, and finally a British Prime Minister who left his mark on his time. 3 – Is there a word, expression, tradition or typical behaviour in this one that particularly amuses you? Certainly, « It rains cats and dogs » is a popular expression that illustrates the love of the English for their pets. 4 – Why is it important to know how to speak this language, whether academically, professionally or from a more personal point of view? First of all in the scientific field, as most of the researchers’ publications are in English,. Then, in the business field as English is spoken on all continents. 5 – What is the main difficulty of this language and what can promote its learning? English grammar is falsely easy and is very different in its structure from that of Latin languages. Grammar and structure learning should not be overlooked. The fact of studying English grammar with a French teacher, who after several years of study masters it relatively well, makes it possible to understand its subtleties. I explain English grammar more easily to my compatriots than French grammar to foreigners. I have not faced the same difficulties since French is my mother tongue. 6 – An anecdote related to your profession or your schooling to tell us? During interpretation missions, several of my French or English-speaking clients insisted that I translate their good jokes. Humour is something that is typically associated with language and culture. It is not always transferable. The best possible translation will not always restore the humorous effect obtained in the original language when it comes to transposing it. 7 – Help us to get to know you a little better by talking about your different travels. In my career I have accompanied English or French-speaking clients in several countries. Each time I loved discovering new cultures and allowing my clients to interface between the languages and cultures involved. 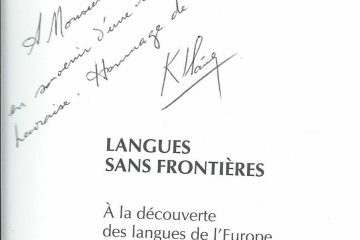 The image that best symbolises my vocation is that of « a bridge between cultures and languages ». 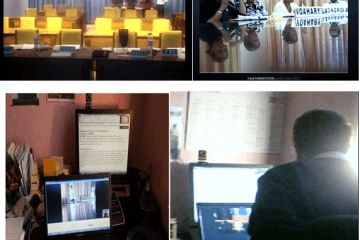 I also provided training to Malagasy executives by videoconference using French and English. It’s fascinating to be able to train people remotely in real time, who are located in the other hemisphere. 8 – What makes you a Superprofessor, in addition to your ability to express yourself in several languages? I know how to listen to my students. I like to discover my clients’ business, their challenges, I like to support them, coach them so that they may achieve their objectives, their personal legend as Paulo Coehlo, the Brazilian writer would say. Contact me for a free discovery session on Skype or Talky.com to tell me about your expectations and needs for your future training project. Link to our article in French about the same interview.